asking who deserves the patent for use of CRISPR-Cas9 as a tool. 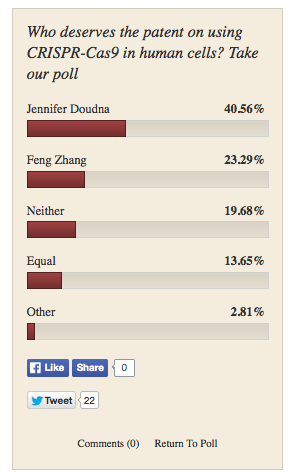 Feng Zhang got only just over half the votes of Doudna. Another take home message from this poll is that a sizable minority–almost one in five– said neither should have a patent on this technology. Geographically the results were fairly consistent across countries, but notably in the UK the top response was, “Neither”. This poll is of course non-scientific, but it is interesting even so to see a fairly decisive result. Let’s see ultimately what happens with the US Patent Office. A stupid poll and blog entry. Emmanuelle Charpentier is the co-senior author on the Jinek et al 2012 Science paper and is coinventor on their patent application. There are many papers on the CRISPR – Cas’s systems that Feng Zhang invented mammalian Cas9 gene editing before and independently of Jennifer and Doudna and Charpentier. Patent offices, courts, and a lot of money on lawyers will sort this out. Well, George, if you had read the original post you would see Charpentier was included with Doudna. If you don’t like the poll results calling them “stupid” won’t change them. I do agree, however, with your last sentence. This poll misses the point that all science is a result of discoveries and experiments based and previous discoveries and that CRISPR/Cas9 application to mammalian cells has facilitated a massive paradigm shift across biology as a whole. No question Jennifer and Emmanuelle made important contributions. That being said, translating this system to mammalian genomes is a massively important contribution as well. The idea that it is all or nothing is completely anti science. Patents are one thing but the credit for contributions to scientific advancement is never a solitary endeavor. You make some great points. It’s worth noting though that many scientists change their tune completely when it comes to the point where they may be able to patent something and we all know scientists with big egos who believe they are God’s gift to science and the world…and that they did it all by themselves.